Namaste! - "We Indians fold our hand in Namaste before you, because we think that God resides in every Human Being." I am Mohd. Shahnawaz. Khan & I have been working as a Govt. 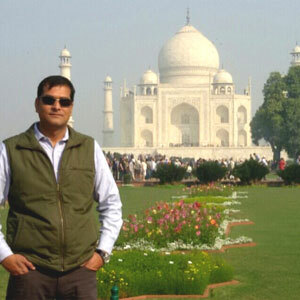 Approved Professional local tour guide in Agra since 2001, with my associate team of guides. Our venture is being patronized by many 5 star and other leading hotels, embassies and foregin missions, multi-national and Indian companies, travel agents, tour operators and excursion agents etc. I have been giving tour guide services to FIT & Group Tourist, VIP & Corporate Guests with their excellent rating and reviews (Click here to read guest reviews) with my associate tour guides. I have Tourist Guide License from Ministry of tourism & culture, Govt. of India. as well as I am professionally qualified M. A in history & Post Graduate Diploma in tourism management, from Agra university , I usually receive comments "excellent service" by my clients . I am resident of world famous city of the TAJ MAHAL, Agra. I have all qualification to serve you as a the best TOUR GUIDE IN AGRA as well as I can customize tours and can arrange car/coach, hotel rooms as per your needs & desire. I enjoy reading books of historical importance and I try to serve my guests better after every tour. My belief is that every traveler should be personally taken care of, and I give full attention to my guests. Apart from sightseeing, I make sure that other necessary aspects like proper lunch etc are also taken care of properly. Once you book any tour, it will always be a tailor made tour, planned according to your interests. Contact me for your Private Guided Tours.